If your cuticles are ragged and your nails are brittle, soak your nails in a cup of olive oil. Before you go to bed, smear olive oil on your feet, put on socks, and you’ll wake up in the morning with the softest feet ever. Soothe your dry, chapped lips, by dabbing on a little olive oil. Massage olive oil on your scalp and hair. Cover your hair with a shower or bathing cap and leave on for about 30 minutes. Olive oil helps repair split ends, heals dandruff, and makes your hair silky, and lustrous. Put a few drops on your hair when it’s dry to eliminate the frizz. Rub olive oil on your hands to soften and moisturize. It’s rich in squareness, a natural organic compound and emollient that penetrates the skin, and won’t leave a greasy film on it. Add a few tablespoons of olive oil to your bath to soothe your skin. Use a little olive oil on a Q-tip to take your makeup off. It’s as good as any drugstore brand. Look for olive oil in lip balms, shampoo, hand lotion and soaps – and always use the purest extra virgin olive oil, which is the least processed,and gets its oil from the first pressing of olives. 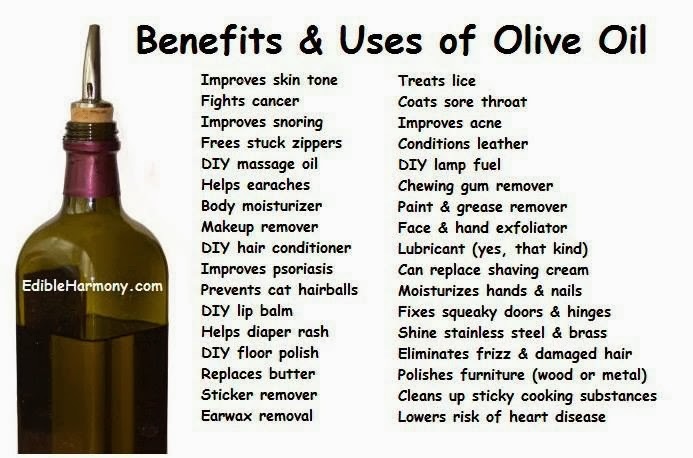 Use extra virgin olive oil not only internally for your inner health, but externally for your outer beauty as well.